We’d love your help. Let us know what’s wrong with this preview of The Fledgling Handbook 101 by P.C. Cast. This might seem like a scary time, Fledgling, but never fear! 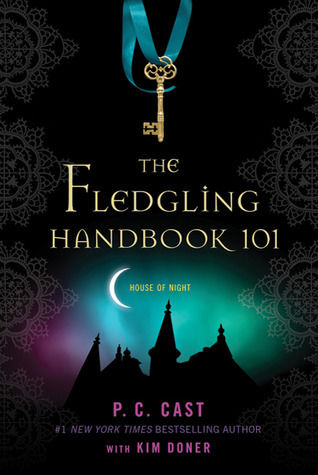 As you start your journey through the ancient halls of the House of Night, this indispensable handbook will aid you in your transition from human to fledgling. Within these pages you will find invaluable infor Merry meet, fledgling. Welcome to a new life, a new world, and a new you. Welcome to the House of Night! To ask other readers questions about The Fledgling Handbook 101, please sign up. I might have fallen behind on the actual reading of this wonderful and intriguing series, but it didn't stop me from loving and enjoying this handbook. As I turned the pages of this stunning book, I felt as if I'd just been enrolled into this school and was learning the history and what to expect after the Change. It's brilliant--packed full of facts, class emblems, rituals, history, mythology, explanations, and there's even blank spaces to fill in your personal Fledging details. ;) And the pict I might have fallen behind on the actual reading of this wonderful and intriguing series, but it didn't stop me from loving and enjoying this handbook. As I turned the pages of this stunning book, I felt as if I'd just been enrolled into this school and was learning the history and what to expect after the Change. It's brilliant--packed full of facts, class emblems, rituals, history, mythology, explanations, and there's even blank spaces to fill in your personal Fledging details. ;) And the pictures, my gosh, the art is beautiful. Absolutely gorgeous. This book was certainly put together with great care and thought, it's an outstanding addition to an already successful series and I think everyone who enjoys the series needs to have a copy. The Fledging Handbook is beautifully made and packed full of vampyre goodness. It's one of those books that you hold and read in awe. It's certainly a winner! For a series that I've practically given up on I wasn't expecting much from this additional tie-in guide. However, my feelings really stem from the fact that this is supposed to be the often mentioned textbook from the series. Now obviously no one's going to read a fictional textbook that comes off like a real textbook -- I hardly want to read the ones I'm supposed to for class. But if you're going to write a pretend textbook you either need to make it believable as a reference by having solid d For a series that I've practically given up on I wasn't expecting much from this additional tie-in guide. However, my feelings really stem from the fact that this is supposed to be the often mentioned textbook from the series. Now obviously no one's going to read a fictional textbook that comes off like a real textbook -- I hardly want to read the ones I'm supposed to for class. But if you're going to write a pretend textbook you either need to make it believable as a reference by having solid details that are otherwise foreign to a fan or give it some charm like the Harry Potter schoolbooks, which manage to present a lot of new information and still retain the feel (specifically the humor) of the actual series. This book manages to be a waste of the paper it's printed on. First, it's printed in a wasteful manner with ridiculously huge margins and text that doesn't bother to fill the page. But even more to the point it's not informative, nearly everything presented in the book is a detail that you could find within the series itself or the associated website. The one exception being a bit of history, which is basically a mutilation of real history that incorporates plot elements from the series. Oh, but I did learn one thing: every rule that's mentioned has pretty much been broken by a character (namely Zoey) at some point in the series. Leaves me torn between being horrified that anyone would think of these characters as role models and pondering the point of creating a set of rules for this world in the first place. Now all that said, I can't even say this is worth reading if you aren't already familiar with the series because it's written in such a bland and uninteresting way that there's no way I can see that it would entice you, let alone get into the series. Muito aborrecido. Só gostei mesmo do capitulo de história e o sobre ser-se marcada. Pense mesmo nele como sendo mesmo um manual do aluno da Casa da Noite. This book is a background to the world of House of Night, with small stories about famous vampyres, about the Change and so on. It could have been much better though. It could have had more intresting facts about the House of Nights, maybe a small world map with dots to mark out where the school can be found, it could have had more about affinity and how that works, more about the studies at the school. Several times the discussed a subject and then just said: this isn't a subject for fledglings This book is a background to the world of House of Night, with small stories about famous vampyres, about the Change and so on. It could have been much better though. It could have had more intresting facts about the House of Nights, maybe a small world map with dots to mark out where the school can be found, it could have had more about affinity and how that works, more about the studies at the school. Several times the discussed a subject and then just said: this isn't a subject for fledglings in third year, so read the next book. There are so many things that could have been explored. They could have talk more about the things we recognize in the book. For example, in the books they do several rituals. It would have been interesting to find out the theory behind them. Not the things we never heard about and don't really care about either. I hated the idea to take a picture of myself as marked and write in my teachers name and their affinity. When I was a kid I got that kind of book about Harry Potter. But in that I had to fill in what I liked about the book, not if I was in it. For example, I would write my teachers name and who they were alike in the Potter univers. But in this book it only felt immature and a waste of space. It was fun to pretend these things when you were 9 years old. This is supposed to be a YA book, it's not fun. I love the House of Night series. I love the story, the characters, the world that the Casts have created. I really wanted to love this. But unfortunately, I didn't. It started off okay, with an introduction into the House of Night world and with the biology of vampyres and how your body changes, I thought that was pretty interesting, because it was so well thought out and it really shows that the author had really thought about the world she created in her books. So that was pretty cool, althou I love the House of Night series. I love the story, the characters, the world that the Casts have created. I really wanted to love this. But unfortunately, I didn't. The rest of the book (apart from a little bit at the end) was about Vampyre History, and I skimmed that too... It didn't interest me, and I felt bad about skimming it and not giving it a proper chance, but I couldn't read it. I tried, but I couldn't. This is a much have for House of Night Fans. I initially that this was a guidebook on the series itself, but it's actually a "handbook." It's written as though YOU are a fledgling student at the House of Night. There's even places for you to jot down notes... like what changes you notice happening to your body, now that you're a fledgling! It's broken up into six chapters or sections. Each one discussing a different topic that all fledgling vampyres should know. I've seen of lot of negative reviews and heard a lot of people say they're dissapointed with this handbook. However, I think it's a great addition to the series and am happy to have it in my library. This handbook, along with the series, was obviously written for young teenagers, as a lot of the vampyre lore and history in the book are simply stories from our own history that have been slightly tweaked. My favorite story was The Tragedy of Pompeii. This book is definitely not for the history buf I've seen of lot of negative reviews and heard a lot of people say they're dissapointed with this handbook. However, I think it's a great addition to the series and am happy to have it in my library. This book is definitely not for the history buff, as it rewrites history for the purposes of the series. However, this book is perfect for a fan to the series that would like to have a beautiful little book to complement and complete their HON library. Being a massive House of Night fan I had to pick this book up to add to my collection! The book itself is very pretty, I love the fact that it is all colour inside and filled with pictures! There is even space for you to write in your own pieces, as if you are attending a House of Night. I won't be writing in the book though, it's just too pretty to do that! As for information, there isn't too much that readers won't already know from the original book series. It is nice to read it and imagine what Being a massive House of Night fan I had to pick this book up to add to my collection! As for information, there isn't too much that readers won't already know from the original book series. It is nice to read it and imagine what it would have been like for Zoey to first see the "rule book" when she was marked and moved to the House of Night. This book was a good idea but it would have been better if it focused more on school rules and the biology of being a vampire instead of the boring stories it had in it. O "Manual do Iniciado" é o livro que todos os que são marcados e que vão para as diversas Casas da Noite têm de ler no seu primeiro ano. Este livro tem todas as informações necessárias que um iniciado precisa de saber para poder viver em paz com o seu novo mundo. É através deste livro que ficamos a conhecer alguns rituais e também a história de algumas situações que são repetidas nos diversos volumes da coleção Casa da Noite. Um livro cheio de magia e de antiguidade que nos leva a conhecer um g O "Manual do Iniciado" é o livro que todos os que são marcados e que vão para as diversas Casas da Noite têm de ler no seu primeiro ano. Um livro cheio de magia e de antiguidade que nos leva a conhecer um género diferente de vampyros e a forma como eles vivem em comunidade com os humanos. Para os vampyros desta história é muito importante para os iniciados lerem este manual, pois assim vão aprender tudo o que precisam de saber no principio da sua estadia da Casa da Noite. É um livro muito divertido pois podemos conhecer histórias sobre personagens muito famosas que aqui são colocados no papel de vampyros, como por exemplo Cleópatra. Temos também a demonstração que o pentagrama não é algo dirigido para o mal mas sim para a divindade aos 5 elementos (Ar, Fogo, Água, Terra e Espírito), todos estes elementos que a deusa Nyx dá como forma de afinidade aos seus filhos (iniciados ou vampyros adultos). Um livro extraordinário e com muita cultura no meio de tanta fantasia. Ps: o livro contém na versão portuguesa 173 páginas e mais 34 páginas do excerto do livro "Antes Bruxa que Morta" de Kim Harrison, ou seja o número de páginas apresentados nesta edição corresponde ao número de páginas geral e não do livro "Manual do Iniciado" em si. I am starting to believe that I am not a fan of handbooks or official guides...I wrote a horrible review of Stephanie Meyer's official guide to "Twilight" because she wrote way too many details and because a good portion of the book didn't have anything to do with the Twilight Series.. I feel the same way about "The Fledgling Handbook 101". The handbook does give some details about how to survive as a newly marked fledgling..However, I often wonder where P.C. Cast got her information for the book I am starting to believe that I am not a fan of handbooks or official guides...I wrote a horrible review of Stephanie Meyer's official guide to "Twilight" because she wrote way too many details and because a good portion of the book didn't have anything to do with the Twilight Series.. I really loved this! I am a huge fan of the series, so i would obviously think so. The book introduces you to the physical and mental change that comes with being marked and the history of old vampyres. The illustrations were beautifully done. It almost reads like a text book for a fledgling, and you can put pictures and your progress of the change in there, which i won't do, don't want to ruin the beautiful book. There could have been a lot more in it though, but a must have for HON fans! Pensei que não teria qualquer interesse, então comecei a lê-lo enquanto esperava receber um livro que eu queria mesmo ler, pensando "Quando o outro chegar não vou ter problema em parar de lê-lo". Foi o meu maior erro. Não consegui parar de ler este pequeno livro que tem histórias tão interessantes e é engraçado ver a autora a aproveitar-se da história da humanidade para encaixar lá os vampyros. Aconselho, acho que é uma leitura leve e interessante. Honestly this book is pretty cute. It's a nice short read and the pages are brightly coloured. When I originally purchased this I was hoping it would read more like a textbook style for an actual class at this school. Instead it's just some interesting facts and a bit more information into the series just put into an easier to read format. The cover is pretty dope though ! Saw this book in NBS last week. Is it because the pages looks like those in magazines? And all that's available are hardcover! It was okay for a guide book. we learn about the ritual and how the vampyre changes and things like what happen in the schools. i was hoping to learn more about other places or more about zoey and her friend and why they are special. but oh well. It was $4 on amazon's kindle sale. I couldn't help it. Seriously just wanted a book to get me closer to catching up to my goal. Finished this in a couple of hours and I'm happy about that. un libro che non aggiunge niente alla serie ma spiega come superare la trasformazione e i vari rituali. Una chicca immancabile. When you have a successful series (as House of Night is) there is always a danger that an author will try and expand it in companion books. These hardly ever work or are as good as the rest of the series. This has proved to be the case here. Near enough the entire book seems to be a retcon and added to the series as it could be. Both the writing and the plot suffer for this. There are some good ideas. Ideas that could have started a new series. Maybe it would have been better that way. The illust When you have a successful series (as House of Night is) there is always a danger that an author will try and expand it in companion books. These hardly ever work or are as good as the rest of the series. This has proved to be the case here. Near enough the entire book seems to be a retcon and added to the series as it could be. Both the writing and the plot suffer for this. There are some good ideas. Ideas that could have started a new series. Maybe it would have been better that way. The illustrations and pictures were striking and memorable where the text wasn't. I feel this book serves as a warning that outside of additional novels in a series sometimes you should leave the timeline alone. Another author also should learn this rather than constantly retcon. I will allow anyone who reads this to guess which Harry Potter author I mean. This is not a great addition to the series. For true fans (which I am not using in a positive way) only. Već godinama želim pročitati serijal Kuću noći autorica P.C. i Kristin Cast. Nakon što sam prošle godine kupila svih devet prevedenih knjiga u serijalu, nedostajao mi je prequel serijala, Početnička početnica, koji nikako nisam mogla nabaviti. Srećom, izdavačka kuća (hvala Algoritmu!) bila je tako dobra da su mi poslali prequel, tako da sam napokon spremna za čitanje! Kad je Početnička početnica stigla kući, bila sam očarana - knjiga je ispunjena predivnim ilustracijama koje oduzimaju dah. Oslika Već godinama želim pročitati serijal Kuću noći autorica P.C. i Kristin Cast. Nakon što sam prošle godine kupila svih devet prevedenih knjiga u serijalu, nedostajao mi je prequel serijala, Početnička početnica, koji nikako nisam mogla nabaviti. Srećom, izdavačka kuća (hvala Algoritmu!) bila je tako dobra da su mi poslali prequel, tako da sam napokon spremna za čitanje! Kad je Početnička početnica stigla kući, bila sam očarana - knjiga je ispunjena predivnim ilustracijama koje oduzimaju dah. Oslikala ih je Kim Doner, a prikazuju povijesne osobe iz serijala, procese pretvaranja u vampyre i mnoge znakove. Ali krenimo ispočetka. Naime, Kuće Noći su škole za tinejdžere koje božica Nyx dotakne svojim Biljegom. U trenutku kad ih ona dotakne, počinju proces preobrazbe u vampyre (znam, znam. Čim čujete riječ vampir odustajete od knjige. No dajte ovom serijalu šansu, vampyri ovdje definitivno nisu klišej!). Početnička početnica je udžbenik kojim se mladi vampyri služe u Kućama Noći. U Početničkoj početnici čitamo o mnogim povijesnim i mitskim osobama koje su zapravo bili vampyri i vampyrice. Primjerice, jedna od njih bila je Kleopatra, zatim Kirka (čarobnica koja se zaljubila u Odiseja), Shakespeare, Ciceron… Saznajemo o njihovoj prošlosti, no usto saznajemo i o vampyrskim obredima i sustavu školovanja. Početnička početnica je veoma zanimljiv udžbenik (ah, koliko bismo češće učili da imamo takve udžbenike u školi) i odlična podloga za početak čitanja serijala Kuća noći. Kuća noći počinje knjigom Obilježena koja prati priču Zoey Redbird, djevojku iz Oklahome, koja se počinje pretvarati u vampyra. Uskoro slijedi i recenzija prve knjige serijala. Nadam se da sam barem nekoga zainteresirala za ovaj serijal! i wasnt expecting to learn to much random stuff from history, even if some of it is altered a bit. A great way to get to know better this amazing world I love so much. I would even want to read the entire library of this school just to consider myself another student. HoN rocks! Every House of Night fan should have this book!!!!! It was very interesting to read. I can't wait to get the last three in the series and the new one obviously.